After you have created a TEAMS Parent account, login to the TEAMS Parent website https://teams.abileneisd.org/selfserve/parent, select a student and click on the “Registration” Tab to complete the Annual Student Information Update for all your Abilene ISD enrolled students. Reminder: Skip the document upload section by clicking “Submit”. Need help? See support information below. click here to login to the TEAMS Parent Website https://teams.abileneisd.org/selfserve/parent, select a student and click on the “Registration” Tab to complete the Annual Student Information Update for all your Abilene ISD enrolled students. Reminder: Skip the document upload section by clicking “Submit”. What is a TEAMS Parent Account? A TEAMS parent account is required to update student information, but it also allows the parent/guardian to view grades, attendance, discipline occurrences, and keep track of the student’s progress throughout the school year. Each parent/guardian only needs one account no matter how many students they have enrolled in Abilene ISD. Abilene ISD employees will always use their district username and password as their TEAMS Parent account. Each parent/guardian of a student creates their own TEAMS Parent account. If a parent/guardian does not have a TEAMS Parent account, then one can be created by clicking on “Register” under “New User” on the TEAMS Parent website: https://teams.abileneisd.org/selfserve/parent. A step-by-step help video is available on the district website at https://www.abileneisd.org/for-parents/teams-grades-self-serve/. Accessing the TEAMS Parent website [https://teams.abileneisd.org/selfserve/parent] and clicking on “Forgot User ID” will allow you to request the User ID be sent to the email address you used when creating the account. To reset a password, click on “Sign-in” and then click on “Forgot Password”. Answering correctly the security question you created during account creation will allow you to change/reset your password. Need additional assistance, see support information below. How do I complete the Annual Student Information Update and Required Forms? Using your TEAMS Parent account, log in to the TEAMS Parent Website https://teams.abileneisd.org/selfserve/parent, select a student and click on the “Registration” Tab to complete the Annual Student Information Update for all your Abilene ISD enrolled students. 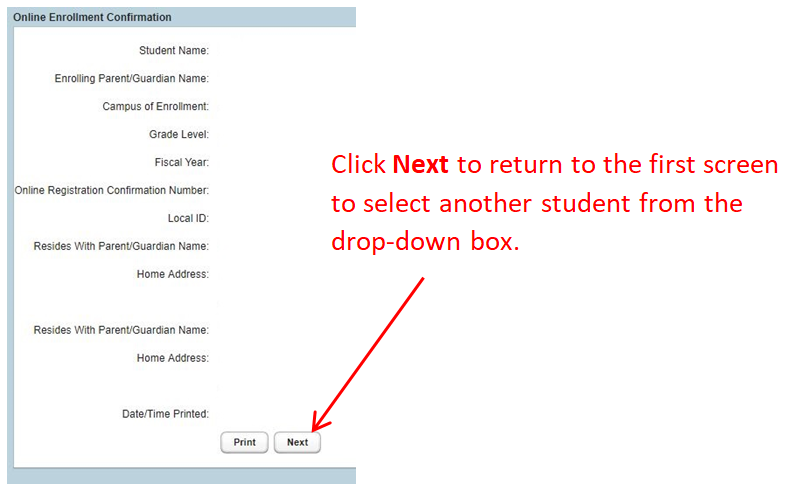 Use the drop-down to select each student and complete the requested information in each section. Skip the Attachments section by clicking on “Submit” and then click the “Confirm Enrollment” button. Confirm Enrollment means you are submitting all the updated student information. Step-by-step instructions in both English and Spanish for each section are available on the left-hand side of this webpage. Contact the campus of one of your students and they will help you complete the required information using a district computer. All students you have enrolled in Abilene ISD can be updated at the same time. There is no need to go to multiple campuses.